Some of the issues we normally discuss in terms of accessibility (price as the main one) made their way into our review of Arkham Horror: The Card Game. It’s not a game that’s an easy recommendation considering the parsimonious offering in the box but if that’s not an problem for you it’s certainly something well worth playing. We gave it four eldritch stars in our review because it’s the only Lovecraft game we’ve ever played where it genuinely feels respectful of the setting. All of that though is going to be irrelevant if people can’t actually play it and we’re all about investigating that here on Meeple LIke Us. Let’s delve into this dark eldritch realm of whispered secrets and hidden mysteries and see if we can find the truth of the matter. Colour blindness isn’t a major problem – nowhere is colour used as the sole channel of information. All the cards come with abundant text and identifiers and every card that plays multiple roles in the game makes use of symbols and icons to complement colour schemes. There isn’t necessarily a lot of good news from this point in. 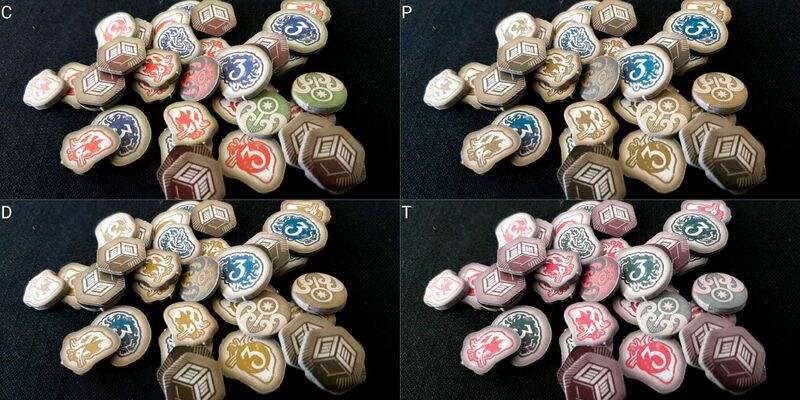 The chaos tokens make use of colour to ease differentiation of automatic fails and critical successes but the colours chosen aren’t a problem for any of our usual classifications of colour blindness. In any case they all have prominent symbology to differentiate them. The smaller tokens for damage, resources and clue/doom all have their own graphical design. While doom and clue tokens have something of a palette overlap for certain categories of colour blindness it’s both solved by the icons and by context. Doom tokens will accumulate on agendas and some monsters. 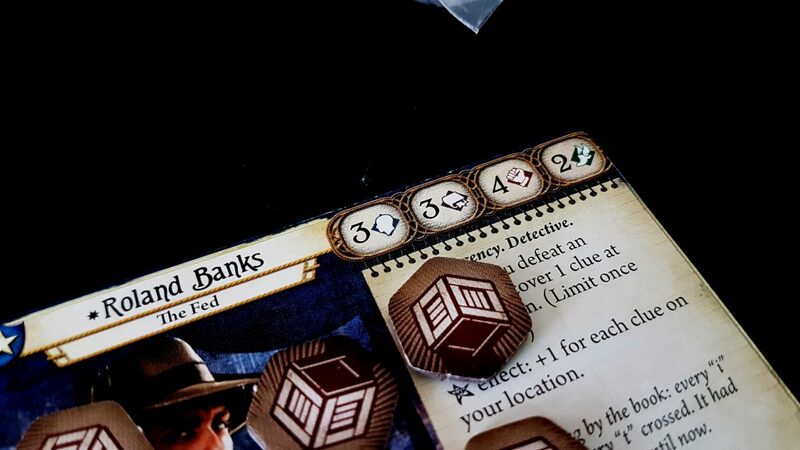 Clue tokens will accumulate primarily on rooms and investigators. Overall then, we strongly recommend Arkham Horror: The Card Game in this category. This is a major problem area. Cards are text and symbol dense, and while they are usually well contrasted they are sometimes presented in a font that is so small as to be almost perverse. This has an impact on the game at all stages of play, from setup to teardown. Chaos tokens are only differentiated by their face design and while that design is well contrasted it does mean that they are totally indistinguishable (by design) by touch. This makes sense of course given the game systems – it wouldn’t be much of a random draw if you could tell the tokens apart by touch. Suffice to say though that this game is entirely inaccessible to those with total blindness. I’m going to need this gun for the rest of the teardown. 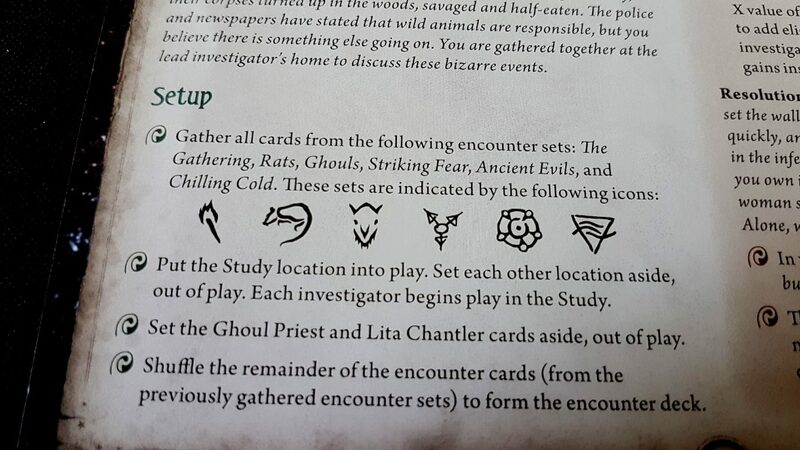 For setup, the construction of a scenario deck requires a player to identify ‘encounter sets’ and group them together into a single collection. This is going to involve searching through previous scenarios for cards that have been allocated there as well as in the shared deck of unused cards. Constructing a starter deck for an investigator requires either careful adherence to construction restrictions or selecting cards by number from the central deck. The number of each specific candidate for the deck is presented in the bottom right of the card. If you can’t make it out, that’s entirely understandable – the font is ridiculously small. It’s small enough to make this a chore even for fully sighted players – all it takes is sub-optimal lighting for a player to be stuck holding the card up to their face to make out these tiny numbers. Investigators come complete with a set of skills, in four categories, and these at least are reasonably clearly displayed and also easy enough to memorize or record in some convenient way. 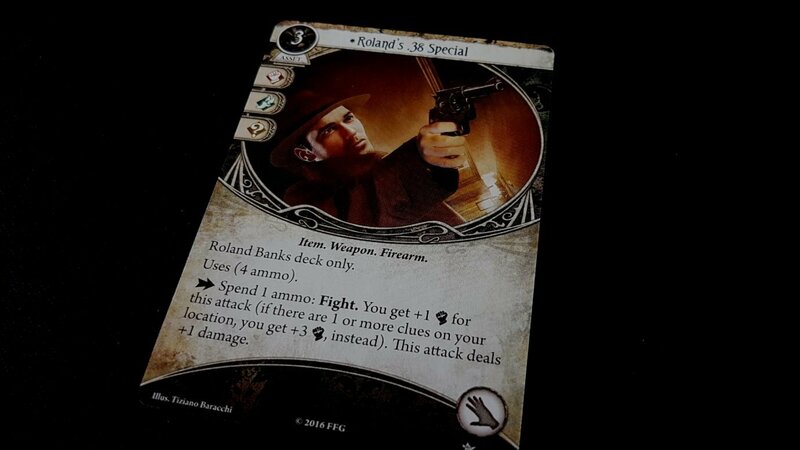 Each investigator also has a special ability and a critical success effect on their card, and these too are easily recorded in some other more visually accessible format. Cards that are played though will come with a range of icons incorporated into the text, and these are both small and often poorly differentiated from other icons with a similar profile. The cumulative effect of cards in play will have a powerful impact on how a character should behave and react to emerging situations, and there is going to be an awful lot of checking cards to see where they apply. This will involve close investigation, likely with an accessibility aid, because these cards have relatively complex interactions and may rotate in and out of play in complex ways including based on distribution in the discard deck. Some cards will get resources placed on them to indicate limited uses, and this is a nice way to represent the information in a tactile way. The standard resource tokens have a different form factor to the clues, so it’s easy to tell them apart by touch. Physical and mental damage tokens have a very slightly different form factor, but it’s not enough to reliably tell the difference by feel alone. Some of the ongoing book-keeping can be handled by other players, if they are available. Other parts can be offloaded onto other tools (such as spreadsheets or even just a notebook). The larger puzzle of what cards work best together and how to synergize your options in the most effective way is not possible to disassociate from the context of the cards. Most scenarios will make use of multiple locations, and even working out what a valid move might be is complicated by the use of symbols to identify non-Euclidian connections between locations. That will ease with familiarity (as will card management, to an extent) but there are only three scenarios in the game and the economy of cards and actions shifts radically with each different scenario. You can, with practise, become familiar with the geography and sensible strategies of any individual scenario. That knowledge is not necessarily transferable outside of the context in which it was gained. We don’t recommend Arkham Horror: The Card Game in this category. As is often the case with this type of game, the heavy reliance on effective synergy and conditional effects renders it largely inaccessible in this category. You need to understand the best way to leverage cards within very tight turn limits to accomplish reasonably complex goals. These might include dealing with multiple emerging complexities such as spawning monsters, or working through debuffs attached to your investigator or location. Sometimes these just make certain tasks more difficult. Sometimes they fundamentally alter the cost of performing actions of certain types. Coupled to this is the need to plan ahead and manage a relatively complex relationship between resources, cards and the various inventory slots you have available. While there’s usually no ongoing cost associated with having a card in play the act of bringing it out is (usually) done by spending an action from an intensely limited budget. 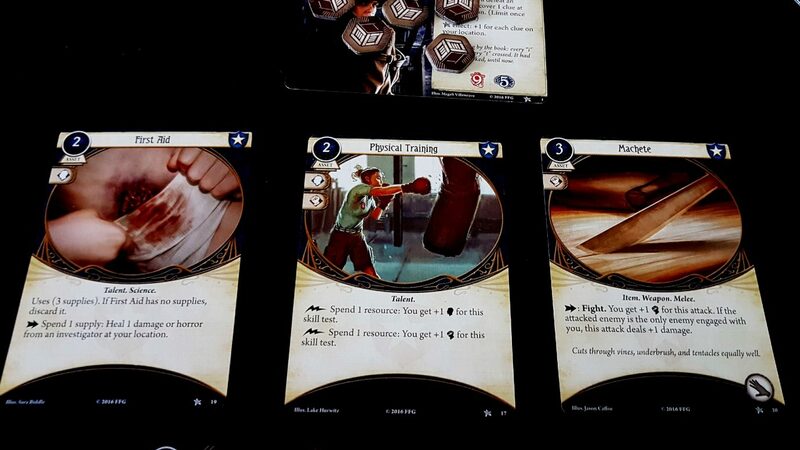 There’s no prep time in the Arkham Horror card game – when the game begins, the timer starts going and every single round the situation is going to get worse. As such, there is a cognitively expensive balancing act that needs to be undertaken every turn. You need to pivot between laying the foundation for future actions, cycling through your deck for the cards you’re going to need, and actually accomplishing the in-game goals. There is also the need for a significant degree of literacy to read card text, and a substantial amount of conditional numeracy. The actual skill value you have in a given task is modified by location, cards played, ongoing effects and active assets. The difficulty you are attempting to hit depends similarly on occasionally variable modifiers such as cards that attach to a location and increase its shroud value. This isn’t even just as simple as trying to work out what number you need to roll on a die – all of this has to be done within the context of a chaos bag that contains a distinctly skewed distribution of outcomes. The probabilities here are more difficult to appreciate than simply ‘roll two successes on three dice’. You need to know the approximate likliehood of success based on the tokens that have been seeded into the game. The strict arithmetic of play is something that can be handled by the table, but evaluating the risk of performing a task is an inherently personal act of calculation. That is unless someone is simply going to actualise a decision someone else makes on their behalf. That is not a very satisfying state of affairs. Memory burdens are significant too as many cards add in abilities that trigger on other things in the game or add new capabilities to a player. Some alter existing actions but require the spending of limited resources. You need to remember all the options you have available as well as in many cases the options that the other investigators have at their disposal. This is a group puzzle to solve and part of your turn is understanding what your colleagues can do to help deal with the emerging situation. Tokens in play have multiple meanings – resources are a currency for playing cards but they are also used to indicate ‘charges’ of limited use items. Clues are also doom tokens, depending on the way they’re facing. Doom on an enemy card is handled differently from doom on the agenda, and clues in a location might not necessarily relocate based on the usual rules. Some treachery cards for example redistribute them in unfortunate ways, or force you to discard them from a limited supply before picking up others. All of this, thematically, represents different kinds of things in the game and so a certain malleable understanding of meaning is necessary for play. 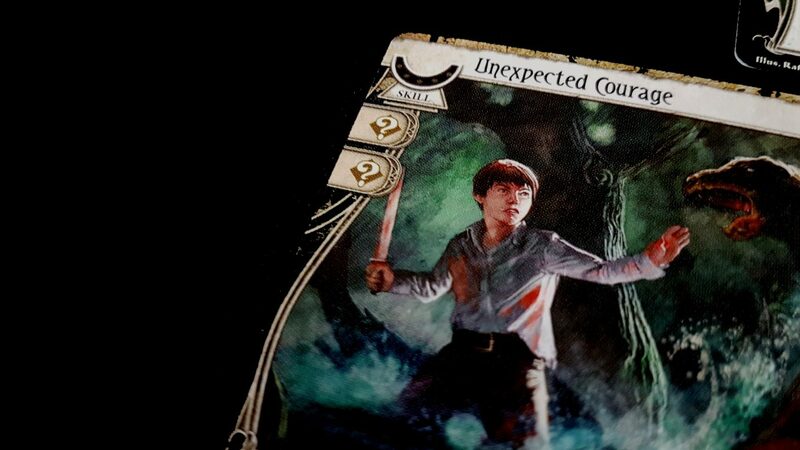 In short, Arkham Horror: The Card Game requires a flexible understanding of an emergent game-state that becomes increasingly more complex and hostile as time goes by. The tools for managing this game-state are highly interrelated, often deeply conditional, and require forward planning and careful management of a pool of resources and cards that is simultaneously highly individual and group dependant. We don’t recommend Arkham Horror: The Card Game at all in either of our categories of cognitive accessibility. There’s a lot of token and card management. Card play is constant, and there is a regular flow of doom, clue, resource and damage tokens that get picked up, spread across cards, and eventually discarded. Luckily hands need not be secret for effective play, and standard card holders will be appropriate as an accessibility aid for most players. There is a hard-limit on hand size, so as long as you can accommodate eight cards at the same time this shouldn’t be a problem. However, there is still a lot of manipulation of the shared game state that goes into play – you’ll need to move your investigator card around, move enemies from locations into your ‘threat area’ and back again, and attach particular cards to certain locations. It’s a game that tends to sprawl with larger location sets because of the need to physically associate cards with their area of effect. You need a fair bit of table space as well as a good range of motion to be able to do it all. Drawing tokens from the bag or cup you’re using is often difficult because they have a tendency to stick together. Often you’ll draw two at once, and then need to decide on which is the actual token that you’re going to use. As with most of the game though this is something than can be handled on another player’s behalf without too many difficulties. If these tasks aren’t possible, verbalisation is completely supported through all the game elements. All your different cards have unique descriptions, all of the locations are unambiguously named, and while instructions might be complex they are never awkward to phrase. ‘Spend a resource from my gun, and make use of my ally to give me a plus three on this attack. Then discard my knife. Now I’m going to fight that nun’. We recommend Arkham Horror: The Card Game in this category. 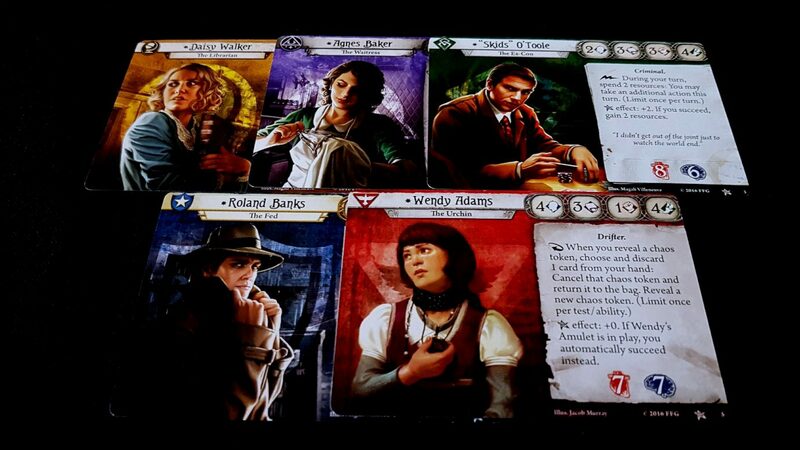 It is difficult to win scenarios in Arkham Horror but that’s not necessary for completing them. The better you do, the easier a time you’ll have it in the next – this sets up a circumstance where failure might be expected, or even inevitable, if you did badly in an earlier mission. A few bad token draws early on in the game might seal your fate before you even have a chance to get started. I won’t be too specific here because of spoilers, but each scenario changes the meaning associated with drawing several of the tokens. 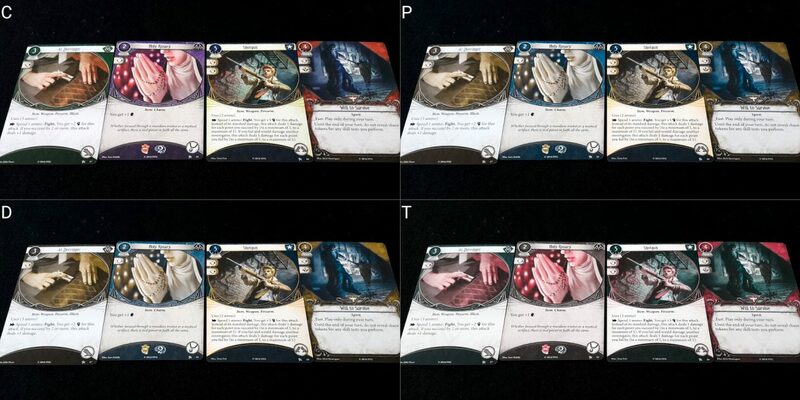 Some of those scenarios have tokens that change values based on the amount of doom in play, with other tokens that increase the amount of doom in play. Some enemies come into the game with doom attached to them. It’s entirely possible at the end of two turns to have progressed the first agenda through absolutely no fault of your own. If you can accept this is a game that is about failing and fighting on that just adds to the richness of the story. If you can’t, it can be an intolerable feature of play. Your successes are hard won, but your failures are sometimes arbitrary. But it’s not all bad news here. 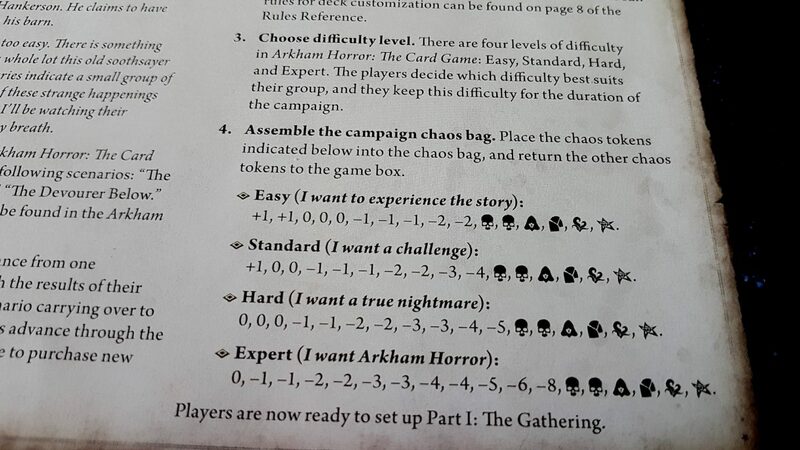 The chaos bag system is tremendously punitive but it’s also possible to scale to whatever level of challenge you like. All of the difficulty levels skew towards penalties, but if you aren’t having any fun with that you can alter the distribution in any way you prefer. Throw in the +1s, 0s and -1s only and you can actually create a situation where you get bonuses as often as you get penalties. That dramatically changes the fun of the game, but it does mean that to a certain extent the ‘despair’ you experience through play is entirely opt-in. I wouldn’t necessarily recommend this approach, but it’s an option you have. At higher difficulty levels the bag just contains poisonous spiders, rats and Elton John CDs. Part of play is working out what you’re willing to give up and still call the session a win. The scenarios have various ‘bail out’ points you can trigger to end the game early, and some have variable interpretations of might what constitute a ‘successful’ completion. From scenario two onwards, you are very unlikely to sweep the board of objectives. The time needed, and the associated escalating challenge, make that incredibly difficult even on the easiest difficulty level. More investigators can help in this but they also scale the challenge upwards by their simple presence. If you have someone in the group who absolutely needs to succeed in all the objectives they are going to be frustrated more often than they aren’t especially given the nature of the game’s hard-core randomness. This is a collaborative game though, and at least failure is a shared property of the table. However, it’s not a state shared equally. The game isn’t competitive, but player elimination is common and sometimes even likely – it’s entirely possible for one investigator to end up killed early on and sometimes because of actions that others take. Some investigators specialise in avoiding combat or negative impacts, and the way some of the monsters works means that they’ll sometimes go looking for other victims. It’s unusual, but you can die in Arkham Horror without having accomplished anything. For individual game sessions that can be aggravating, but if playing in a campaign it can result in permadeath and the investigator’s removal from future scenarios. The affected player can pick another investigator and carry on but this represents a loss of accumulated experience and dedicated deck management. As with the Pathfinder Adventure Card Game I think you’d be entirely forgiven for ignoring these rules if issues in this category are relevant to players. Unusually too, this is a Lovecraft game that is genuinely good at invoking the underlying cosmic horror of the source material. I don’t think anyone would come away from the game feeling shaken or frightened, but it’s a game that absolutely nails the slowly growing escalation of existential dread and uncertainty that is core to Lovecraft. Those of a sensitive disposition, and especially young children, may not find the content very palatable. Overall, we don’t recommend Arkham Horror: The Card Game in this category. While you can skew the difficulty in any way you like, the problem is that it won’t lead to an enjoyable game. There needs to be a risk of failure that cannot be mitigated in order to bring out the most in the gameplay mechanisms. We have a good story here in terms of representations of men and women. There are more women than men, and all of them are presented in a manner that stresses their individual personality types rather than their physical attributes. 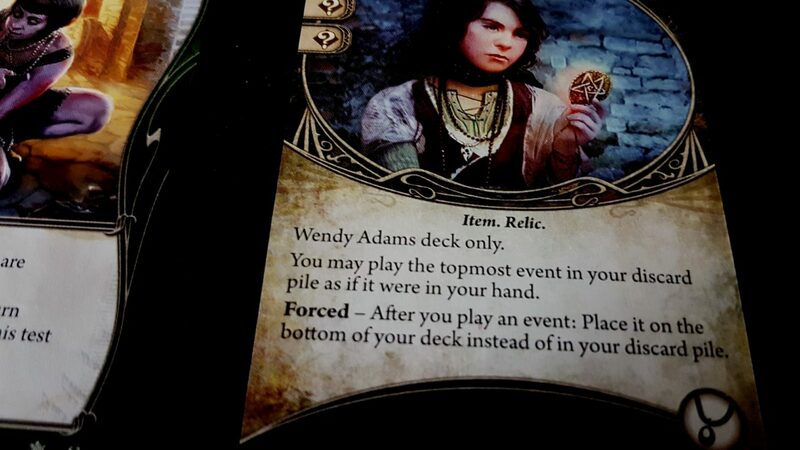 This is markedly better from how some of the art was presented in Elder Sign. The manual adopts a ‘he or she’ style to the pronouns too,which avoids the assumption of default masculinity in its players although I would prefer genuinely gender neutral pronouns for maximum inclusiveness. 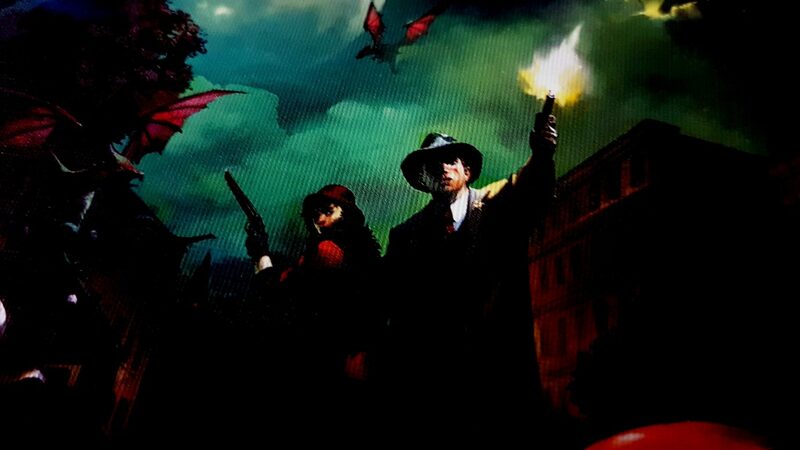 The box art shows a man and a woman, and as with Elder Sign they’re both obviously proactive bad-asses kicking tentacles and taking names. However as is usually the case with Lovecraft games this is a world for White People Only. This remains a problem even if it’s entirely in keeping with what we would presume to be Lovecraft’s own preferences. Those with religious or otherwise spiritual objections to games featuring a heavy amount of occultism will likely find many reasons to be troubled by Arkham Horror: The Card Game. Some character classes are unabashedly mystical in their powers and even those that aren’t still flirt with magical items and spells as part of their regular activities. While nothing in the game material particularly glorifies any of this, it also doesn’t offer much condemnation for directly interacting with dark, secret powers in the otherworld. That is, if you discount the looming imminence of complete obliteration at the hands of uncaring leviathan Gods from beyond humanity’s understanding. As usual, I have issues with the tired and reductive portrayal of mental health as a ‘sanity meter’, but I think the game does a better job of handling it than many games of this type. I don’t mean it’s good by any stretch of the imagination but some of the terminological handling of it is more appropriate and less stigmatising. You don’t take ‘sanity damage’ for the most part – you take ‘horror’. Accumulated horror leads to ‘mental trauma’. Unfortunately, mental trauma leads to ‘insanity’ and each character still has a buffer of sanity that acts like a dipstick that can run low before it gets topped up by some convenient gameplay mechanism. The biggest problem in this category though is the ludicrous amount of money you’ll need to spend to get the most out of the game. The ‘living card game’ model is in many respects the ethical way of handling a collectible card game – it guarantees at least everyone gets a fixed pack with each new release. Nobody has to buy dozens of boosters just to be in with a chance of getting the card they want. The publication model here isn’t really the problem – rather, it’s the shelf-life of any individual part of the game. In both our X-Wing and Blood Bowl teardowns we made mention of the fact they were games that needed an escalating financial outlay before you got the best out of them. That was true then and true now. However, if all you have is the core set of the X-Wing Miniatures Game you can get an awful lot of enjoyment out of mastering the ships you have there. You can learn about the trigonometry of squad movements, or learn how to really spec out an X-Wing for maximum impact. You can build mastery in the game systems, playing it again and again and again. You don’t lose anything by investing deeply in the game you get – you extract more value. Sure, you’ll eventually want the Millennium Falcon and Slave One and more, but you don’t actually need them to get an awful lot of fun out of a core set. 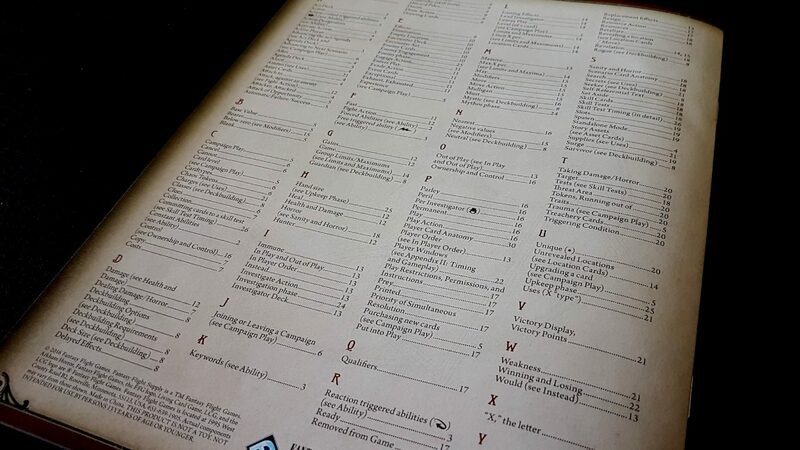 Similarly with Blood Bowl – you can play that base box two dozen times and still be having fun and learning new things. There’s value to be had in getting really stuck in to the game you get, and that value only increases when you add in more variety to the teams. These are games that get better the more you play them and the more systems you have to mess around with. They don’t get worse for not having a constant injection of new material. That’s not at all true here. The scenarios you get in the box are great. The decks you build are fun and interesting. The game systems retain freshness across multiple plays but the scenarios very rapidly lose their appeal because it’s difficult to appreciate a plot twist you’ve already seen a half dozen times before. There is an erosion of your fun that accompanies each play through a scenario. You can try it with different characters and approaches, but the first time is always meaningfully more interesting than the second, and the second much more interesting than the third. That means if you buy this and you like it, you will need expansions and new scenarios. Those are neither particularly cheap nor particularly generous in what you get. If you buy the Dunwich Legacy expansion you’ll pay about £30 at retail for a paltry two further scenarios. That’s, in the words of Fantasy Flight, a ‘deluxe expansion’. The expansion starts a new cycle of eight scenarios, of which six you’ll need to buy as separate Mythos packs at a list price of anything between £12 and £20. So, to experience the full Dunwich Legacy cycle you’ll need to spend something in the region of ONE HUNDRED AND TWENTY POUNDS. Remember, each of these scenarios lasts a couple of hours at a generous push. I mean, c’mon – seriously? That is absolutely bananas. And remember, if you want to play with more than two people or do any kind of meaningful deck building you’re also going to need another base set to go with it. There are fan-made scenarios that you can use, but then you add in the cost and hassle of getting them properly printed out for a scenario that doesn’t have the benefit of the resources a company like FFG can bring to bear. I wish I had done this basic arithmetic myself before buying the expansion because there’s no way I’m sinking that kind of money into this game and as such all that the ‘deluxe expansion’ bought me is the gaming equivalent of blue balls. I sent that expansion back unopened. We absolutely do not recommend the Arkham Horror Card Game in this category. The reading level required for play is high, and the discussion of strategy you’ll undertake is both sophisticated and subject to a degree of communal negotiation. More than that, even terms that are learned and usable will sometimes change their meaning over time. You’ll be working within a mostly familiar context, but with unfamiliar jargon and often almost unpronounceable concepts, creatures and items. When playing solo it’s not necessary to communicate any of this, but the reading level issue remains. We don’t recommend the Arkham Horror Card Game in this category. Well, I guess the poor performance across the board saves us a lot of work here! The only two categories where we recommend this game are in colour blindness and physical accessibility, and there are no additional issues that emerge from the combination of these. The individual recommendations we give for single conditions would guide anyone way from this – basically, any intersection of conditions just intensifies our existing advice. Scenarios in Arkham Horror might be between forty five minutes and two hours depending on how much you’re investing in every move. As such, it’s long enough to exacerbate issues of discomfort and also intense enough to make that likely. You don’t get a lot of opportunities to relax during play – things are going wrong all the time and every action is vital. You can’t play on autopilot. It is though a game that you can drop out of without much impact – it plays all the way down to solo games, and the difficulty scales (somewhat) as investigators are eliminated. The difficulty curve oscillates a bit as a result but let’s be honest – you probably weren’t going to succeed anyway. Well, these are some disappointing grades across the board. Arkham Horror: The Card Game isn’t the least accessible we’ve looked at here on Meeple Like us – that dubious distinction still belongs to Blood Bowl – but it’s not far off of it. It’s not often that we award a flat out F but we have one here for the socioeconomic category. The cost and lack of replayability that goes into a borderline exploitative release cycle means that we just can’t give it anything else unless you genuinely have no concern for the cost of things. I mean, for the £120 the full Dunwich cycle will cost you could buy three amazing games you could play forever and still have money left over for the complete collection of Lovecraft’s works. With the ‘deluxe’ expansion alone you double the price of the game not just to find out how it ends, but pretty much to find out how it starts. 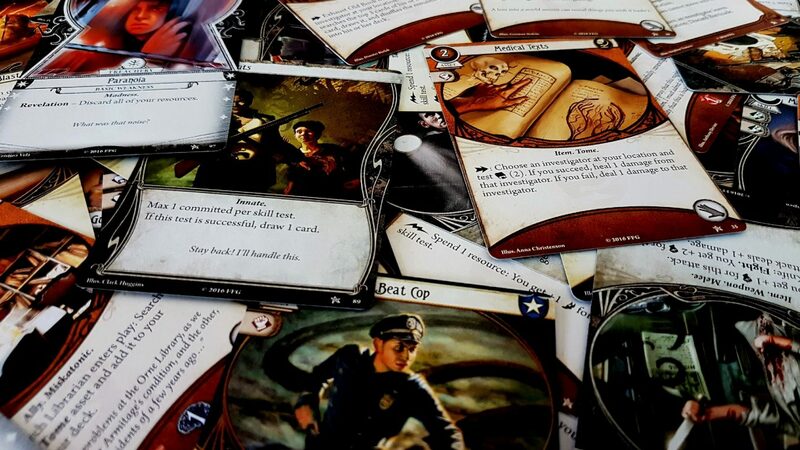 In terms of the fun and quality of the experience Arkham Horror: The Card Game is genuinely great – we gave it four stars in our very positive review. However, there’s little to recommend it for those with accessibility requirements. Or for anyone that hasn’t found the unlimited money cheat at their local bank. That’s always unfortunate but if none of that puts you off I certainly think you’ll find your time with the game to be a rewarding experience, at least for the first time you sit down with any of its intensely interesting scenarios.